Are you tempted to sell your old car or trade it in on a new one? If you are, and you want the best value for your investment in a new vehicle you’ll want to know what brands and makes are likely to be the best deal when you decide to resell them 5 years down the road. Depreciation is just a fact of life when it comes to automobiles. Every new car buyer has heard that “thunk” caused by 20% of its value falling off as they leave the dealer’s lot. However, some vehicles have a proven history of retaining their value longer and are therefore the “better return” than others. Kelly Blue Book, an organization that has been in the car valuation business for decades has put together a list of the top 10 vehicles that they predict will have higher resale value than others in their class 3 and 5 years downstream. We hope you like trucks. Of course predicting resale value of a new car is not an exact science but with KBB’s extensive database of past resale performance they come mighty close. 2016 Toyota Tacoma. Completely redesigned for 2016 the Tacoma midsize truck is expected to continue its industry-leading history as the best resale value. 5 year value is estimated at 62%. 2016 Toyota 4Runner. This rugged body on frame SUV has few direct competitors which is one reason it remains a resale champ. 2016 GMC Canyon. A tough, American made midsize pickup, the Canyon has been a leader in GMC sales and has a 5 year value estimated at 60%. 2016 Chevrolet Colorado. Slightly smaller than the Canyon but a whole lot sleeker looking and now available in diesel, the Colorado has been a favorite for truck fans since it first came out. 2016 Jeep Wrangler. The Wrangler holds on to its value because it is an icon with an impressive legacy if for no other reason. The 2016 model is the most comfortable and performs significantly better than any of the models in its past. The Wrangler is expected to retain 55% of its value after 5 years. 2016 Toyota Tundra. The bestselling full sized pickup in America the Tundra consistently posts the best resale numbers for its class and there is no reason to believe the 2016 model will do any differently. 2016 Subaru WRX. If trucks aren’t your thing but snappy acceleration, superb handling and AWD is the WRK deserves your attention as a resale champion. Priced in the low $30Ks this enthusiast car is expected to retain 50% of its value after 5 years. 2016 Chevy Camaro. The Camaro has been on and off the list a number of times over the decades but the 2016 version with its complete overhaul and superior “cool factor” earns it the number 8 spot this year. Expected value after 5 years is 49%. 2016 GMC Sierra. Another full-sized pickup that’s not the biggest seller but because of its relatively small numbers (rarity) and trusted brand has managed to earn a spot on the list with a retained value of 48% after 5 years. 2016 Subaru Forester. The Forrester was one of the first crossovers and has built a reputation for reliability and practicality that appeals to the family who needs the space but who also want a “truck” that drives like a car. That’s the list and when you think about it it is pretty amazing. When you make that last payment on the 60 month finance plan your vehicle will still be worth 55% to 62% of its original value if you bought one of the top five on the list. What other big ticket item retains that kind of value? 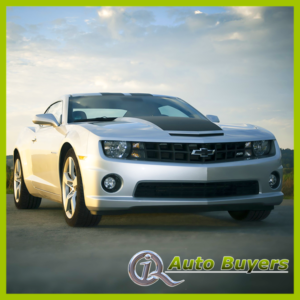 For more news on all things automotive follow our blog on IQ Auto Buyers!